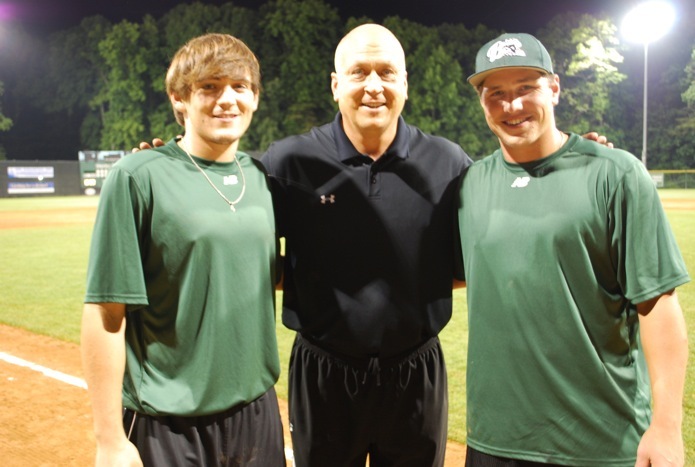 Renfroe Powers Big Train With 7 RBI; Super Hero Night is TONIGHT; Doran is Pitcher of the Week. Renfroe Powers Big Train with 7 RBI! This swing produced Hunter Renfroe's first home run of the night. Another big night for Hunter Renfroe (Mississippi State) and the offense, another huge win for the Big Train. Renfroe would lead an offensive onslaught against the Youse's Orioles last night, driving in seven runs on four hits (including two home runs) to get the Big Train the 15-1 win. Renfroe would make his first strike in the top of the second, hitting a leadoff home run to give the Big Train a 1-0 lead. "They were challenging me with fastballs," said Renfroe. "I hit fastballs pretty well." The home run would be followed by a double by Colin Kish (Florida Southern) and then an RBI single by Tyler Thomas (Shepherd), giving the Big Train a 2-0 lead. The following inning, the Big Train would start building their lead, scoring three runs on RBI hits from Brendan Hendriks (San Francisco),Renfroe, and Kish (who hit a double, single and double respectively) taking a 5-run cushion into the bottom of the third. The bottom of the third would see starter Bo Logan's (Florida Atlantic) third consecutive inning without giving up an earned run, and Logan's dominance would set up another big inning for the Big Train in the top of the fourth. Boon Logan has given the Big Train great pitching so far this season. After a triple by Cam Neal (Tulane) drove in Thomas to start off the scoring, Adam Barry (Cal State Northridge) would reach base after getting hit by a pitch to bring up the hot-hitting Renfroe with runners on the corners. Renfroe continued his tear of dominance at the plate, hitting his second home run of the night; picking up RBIs number four, five and six to extend the lead to 9-1. That home run, his eighth on the season, ties his own team record for a season. "He works hard," said manager Sal Colangelo. "He's learned how to stay inside the ball and drive it the other way. He's a phenomenal player. Probably one of the best ... in the country." Pitching would dominate the fifth inning, preventing both teams from scoring, but the Big Train would continue to build their impressive lead once again in the six. Hendriks, Renfroe, and Tucker Tobin (George Mason) would load the bases for Kish with two down, and he would deliver big with a single that would score two runners, pushing the score to double digits. The Big Train would score four more runs over the final two innings, including an RBI single and a sacrifice fly by Renfroe, to make the final score Big Train 15, Youse's Orioles 1. Click here for last night's box score and play-by-play. 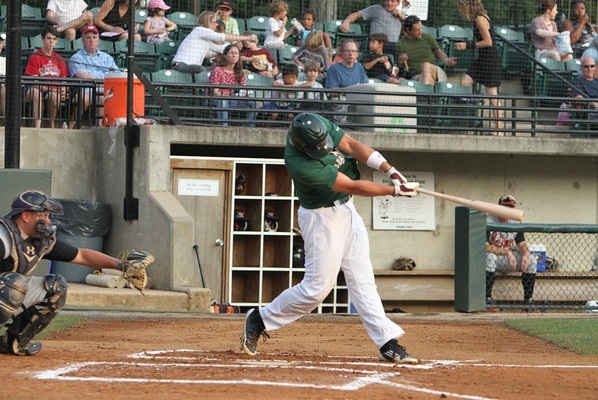 The Big Train will look to build a new winning streak tonight as they host the Rockville Express at 7:30 PM for their second game of a three-game homestand. Tickets to the game can be purchased here or at the gate! - Hunter Renfroe's numbers over the past nine games are staggering: 16/38, 6BB, 15R, 21RBI, 8HR, 2B, 2SB. His averages are impressive as well - .421/.500/1.000 (AVG/OBP/SLG). While getting on base exactly 50% of the time is impressive, the 1.000 slugging percentage is unheard of. That is higher than any season in MLB history and can be simplified this way: In his last nine games Renfroe is averaging one base per at bat. - Renfroe is now leading the league in home runs, in second place with 23 RBI and a .905 slugging percentage, and in fifth place with a .385 batting average. - Colin Kish quietly had a solid night at the plate with four hits of his own. "I was working on really relaxing," said Kish. "I tried to do some things that I wasn't doing the last game and I was seeing the ball well ... [Shirley Povich Field] is a great atmosphere to play in with all the fans and that really helps." - The pitching staff combined for no earned runs allowed last night, striking out 12 total batters while giving up only seven hits. "I felt I did a pretty good," said starter Bo Logan. "When you pitch with the lead it's a lot easier. You try to go in there and just get first-pitch outs." 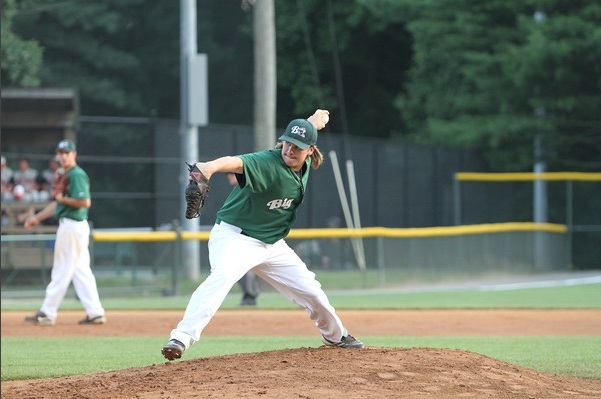 Logan pitched 5.1 innings giving up no earned runs while striking out six, keeping the Big Train in the game early. - Bo Logan is now tied for the league lead in wins with three and is second in ERA with a 1.04 average. TONIGHT is Super Hero Night at Povich Field! 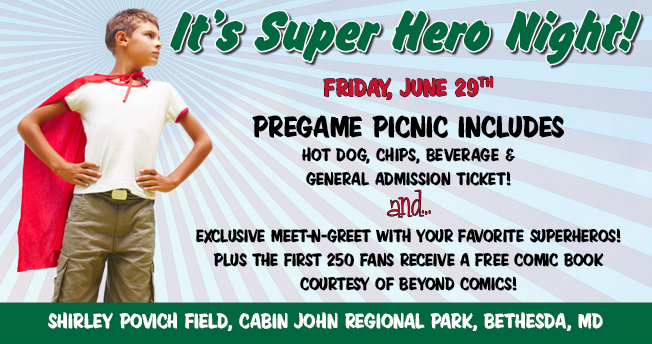 Come see Spiderman, Batman, and Iron Man, as well as the BethesdaBig Train TONIGHT at Povich Field. Be there at 6:00 when the gates open and buy a ticket to the Davis Family Picnic Pavilion! On Friday, you don't need to be part of a big group to use the pavilion! You can buy tickets for you and your family that will allow you to meet the super heroes! Tickets include meeting the characters, admission to the game, and a voucher good for one hot dog, one bag of chips, and onedrink at the Home Run Cafe. Make sure you show up early as Disney Night, our first event of this kind, was a huge success! If you would like to reserve your spot now, click here! Also on Friday, come to Povich Field and see how our new partners atEZ Hydro Cooler intend on making sure that everybody stays super cool on a warm night. Better yet, go to their website and see what they have planned. Ryan Doran during his start this week. 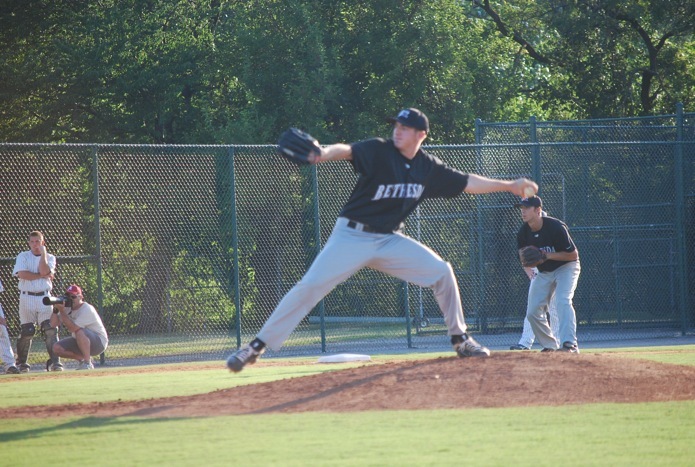 "Ryan Doran (San Diego State University) of the Bethesda Big Train has been named the Cal Ripken Collegiate Baseball League Pitcher of the Week for the week of June 18 to June 24. Doran started against the rival Youse's Orioles on June 23 and held them to one hit over five shutout innings en route to his team's 12-1 win. The righty struck out the side to start the ballgame and did not allow a hit until the fifth inning (a single). He never walked a batter and struck out five to pick up his first victory of the season." Do You Do Any Kind Of Advertising Online? I don't. And I decided to find something to fix it. - And lets you do it all with absolutely no expense at all. want to at least see what it was about? big pile of money, fancy cars and their latest product. to put your own ad! of people ask me how much this costs. Free Gift: Steal The "Secret Spot"
Generate wave after wave of targeted traffic on-demand! Put your ads on this marketing "sweet spot" and you can guarantee massive exposure for any product you want to promote - starting now! WASHINGTON (WUSA) -- When you think about DeMatha, a 6-4 record on the football field is not exactly what first comes to mind. The 2011 season was the Stags' first under newly appointed head coach Elijah Brooks and was described as a bit bumpy by offensive coordinator Tim Breslin. 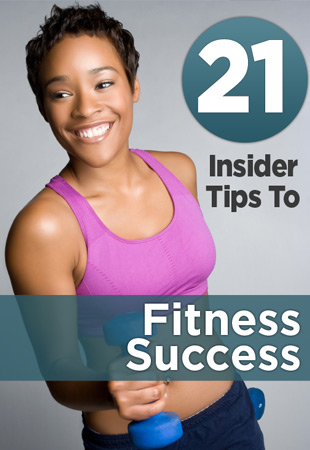 "There's a natural period where you're going to go through a transition. I think this year we've got good kids, we've got good talent, so we'll be as competitive as we want to be," explained Breslin. Spend five minutes watching DeMatha during their offseason 7-on-7 drills and you'll understand coach Breslin's statement about the talent on the roster. The team's 2014 junior class is expecting to have a minimum of 15 Division-1 recruits. Attending a practice with this much athleticism would have any college scout in the country drooling. Headlining the junior class is wide receiver Cam Phillips. The 6-foot-1 speedster is garnering interest from Ohio State, Southern California and already has an offer from Virginia. Phillips recently was named an MVP at a Nike football camp in Charlotte, NC. to Oregon and an offer from the Terps. And the list goes on. And on. And on. Running back Taiwan Deal (UMD, PSU), running back Mark Allen (UMD, WVU), tight end Austin Petty (UVA, UMD), 6-foot-9 offensive lineman Brock Ruble (UNC, UVA), and 6-foot-3 offensive lineman Kyle Jones (UVA,UMD) bolster the rest of the 2014 prospects on offense. While none of these guys have firm offers, yet, gaining buzz from these prominent colleges before a junior season is as promising as it gets for DeMatha. The defense doesn't fail to disappoint either. Standing like an oak tree at 6-foot-4 is defensive end Deonte Holden (UMD, UVA) who will tandem on the outside with Juwhaun Bentley -- recruited by Tennessee, Georgia Tech among others. The linebacker position arguably boasts the team's most important player in Spencer Kleinrichert, who owns offers from Massachusetts and Maryland as well as interest from Stanford, Notre Dame and Boston College. The secondary will be tested in the pass heavy WCAC, but features two ball-hawking defensive backs in Jamal Robinson and Jarriel Jordan (Rutgers, UMD). It's clear from the seriousness of June workouts that DeMatha is ready to put the underachieving 2011 season behind them. 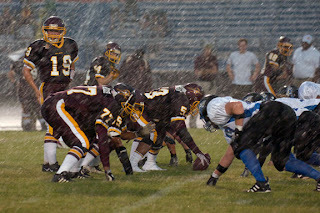 The junior class will make or break the 2012 football season. (Photo caption: Four 2012 DeMatha scholarship players during the 2012 national signing day). Support DeMatha Football and Broadcast Your Business Message To Millions in DC/MD/VA and beyond. Click Here For More Information. are you not hearing about? Hundreds of stunningly effective, cancer-beating treatments are saving lives around the world right now. There are so many potential and proven ways to defeat cancer, no one has ever collected them all into one place —until now. . . But now every breakthrough, life-saving cancer treatment on earth is right at your fingertips. I'm pleased to announce the Cancer Defeated team has gathered every single alternative cancer treatment on earth - more than 350 of them-into one place. . .
And I want to send you this remarkable book for FREE. Click here to watch a video presentation about the most exciting, ground-breaking source of information in the history of cancer treatment. Do you take vitamins, minerals, and antioxidants — and yet you're still suffering from the health problems you were hoping these pills would get rid of? It could be that you're missing a whole category of supplements that are just as important — and almost always overlooked. Hardly anyone knows about these critical nutrients — even America's most famous natural health advocates. Many alternative medicine doctors in the U.S. don't even know about them. Or they do, but they don't consider them very important. This is probably the most underrated group of nutrients on earth. The natural nutrients I'm going to tell you about in this issue can make the difference between sickness and health, cancer or no cancer… and so much more. They even help autistic kids recover normal function. I believe they are absolutely essential to every cancer patient. Yes: EVERY cancer patient should be taking them. I need to tell you something very important about the vitamins you're taking. But there's a Medical Doctor who is widely considered to be an expert on the dangerous and hidden pitfalls of today's most popular supplements, who is dedicating himself to blowing the lid off this dangerous cover-up, starting withthis revealing video you have to watch now. The stakes are high and there's no telling when the powers-that-be will take this video down. Click here to watch it before it's too late. These tiny little warriors could go to work for your health in a dramatic way. Because it's how your body was made to function. You need enzymes if you expect to be healthy. He was an expert on embryos, and he observed something interesting about the placenta, the organ that forms soon after conception, attaches itself to the wall of the mother's uterus and, through the umbilical cord, provides nutrients and oxygen to the developing baby. Dr. Beard realized that the placenta had many similarities to a tumor — both exhibit virtually uncontrolled growth. The placenta grows unchecked until the baby's pancreas begins secreting enzymes. At that point the placenta stops growing. This led him to believe enzymes might also inhibit the uncontrolled growth of cancer cells. In the end, however, the medical establishment 'disproved' his theory with false and faulty research and rejected enzyme therapy. Beard died in 1924, angry and discouraged. About 25 years later, Dr. Max Wolf decided to research enzymes as a possible treatment for cancer. He eagerly sought information from medical libraries all around the world, and eventually came across Dr. Beard's carefully documented book. The oral pill he created, Wobenzym, can still be purchased in the U.S. It's a very popular pain reliever in Germany, because — as I mentioned earlier — protein-devouring enzymes target inflammation much like pharmaceutical NSAIDs. However, Wolf's research has been largely ignored by the U.S. medical community. Wobenzym is not a drug. You can purchase it in some health food stores and on the Internet. There are many other brands of enzymes, all easily available. I wrote a Special Report on enzymes and enzyme therapy called The Missing Ingredient for Good Health. If you're not up to speed on these important nutrients — and especially their role in cancer therapy, my report is a good place to start. Although most natural and alternative medical doctors hardly give enzyme treatments a second thought, alternative cancer doctors know and use them widely in their treatments. Because of the fierce persecution of alternative cancer doctors in the United States, there actually isn't much flow of information between general practitioners of alternative health and those few who ARE willing to stick their necks out and treat cancer. That's one reason so little is known about the importance of enzymes. Dr. Nicolas Gonzales, a New York physician who's well-known in the alternative cancer treatment world, is probably America's leading expert on enzyme treatments. But most alternative cancer doctors at least include enzyme supplements in their protocols. And, of course, most also recommend enzyme-rich raw foods. In a study of patients with pancreatic cancer — usually considered an 'automatic' death sentence — 30 survived for more than two years, and some survived five to nine years. I'll quickly define the three types of enzymes — and more importantly, what they can do for you. My good friend Ty Bollinger just started a new weekly Internet radio show athttp://www.voiceamerica.com/show/2106/the-cancertruth-chronicles. Tens of thousands of people reading this newsletter have bought Ty’s book Cancer — Step Outside the Box or his Special Report, The 31-Day Home Cancer Cure, so I’m certain you’ll want to check out what he has to say on his new program. As you can imagine, this is a complex process and things can easily go awry. In fact,enzyme deficiencies are either the main or secondary cause in a long list of illnesses. If we lived in a perfect world, everyone would eat fresh, raw foods and we'd seldom need an enzyme supplement. Raw foods are naturally high in enzymes and full of other vital nutrients as well. But the vast majority of Western foods are cooked and processed, which effectively kills all their enzymes. Anything that's been heated above 117 to 118 degrees Fahrenheit is essentially dead. There's nothing alive in that fast food meal you had for lunch. But even home-cooked meals can contain all-dead foods, at least in terms of enzymes. Frankly, a 75 percent raw food diet is hard to achieve. But it's a benchmark to aim for. And one-fourth (25%) should be the minimum you aim for. A deficiency in any of the three can cause serious health issues. For example, this is the root cause of lactose intolerance—victims are deficient in the enzyme (lactase) necessary to break it down. Lactose, for those who don't know, is a type of sugar found in milk. People suffering from lactose or milk intolerance usually find they can tolerate it just fine when they start supplementing with the enzyme, lactase. They go from being desperately sick to just fine. Meaning: The answer to "food allergies" may not be giving up everything you like. Instead, it may be providing your body with the enzymes it needs to digest them. The same is true, by analogy, for many other "mystery" illnesses that don't go away no matter what you do (and if you have one of these mystery illnesses you know what it's like to try one thing after another). It's certainly worth trying enzymes to see if you get better. But I can't fill in all the details on "the right enzyme for the right health problem." I tried to do that in my Special Report, The Missing Ingredient for Good Health. The medical bias against supplements is the main reason most mainstream doctors don't believe you need enzymes in your diet if you want to enjoy a healthy life. But why are alternative doctors so in the dark about enzymes? I see a large number of books and newsletters — not to mention ads — about every alternative health topic under the sun. But it's not all that common to see an article about supplements. They're recommended from time to time to help with digestion. And proteolytic enzymes — the ones that break down proteins — have caught on in a big way as pain killers. But I still don't think enzymes get the attention they deserve. And — this is important — the typeof enzymes you need for cancer and the way you take them are different from the enzymes you merely take for good digestion or pain. In an ideal world, if you ate only fresh, organic raw foods, and you were young, you'd get most of the enzymes you need. Youth is important because the older we get, the fewer enzymes our bodies make. But with the Standard American Diet, and with even 'healthy' foods nearly always being cooked, few of us get the enzymes we need from our diets. And the standard diet of cooked and processed foods actually degrades the body's ability to make its own enzymes. We literally wear out our pancreas — our main organ for producing digestive enzymes. We destroy our enzyme-producing capacity by working the pancreas to death, as it tries to compensate for the enzymes we're NOT getting in our food. If you don't eat nearly 100 percent raw organic foods in the form created by God, you should take enzyme supplements to make up for the lack. The potential benefits of enzymes go far beyond cancer. Some of the most astounding results relate to autistic children. In one study, a whopping 91% of a group of 260 autistic children improved when using enzymes. More than one third described this improvement as "very great or impressive". More concerned about heart disease than autism? We've got you covered. A Spanish doctor reported stunning results in just weeks for his blood clot patients, reporting that nine out of ten got completely well. Why couldn't you, too, correct this common 'disease of aging'? It's well-established that proteolytic (protein-eating) enzymes thin the blood. If you're taking blood-thinning medications like warfarin, it's quite possible you can replace them with enzymes and be infinitely better for it. I've also seen feedback from people who experienced dramatic drops in cholesterol after starting proteolytic enzymes. If arthritis or an athletic injury has you moving slowly and painfully, you'll be encouraged to know that 90 percent of 1,004 rheumatoid arthritis patients got better using enzymes. And a double blind controlled study showed that athletes healed and were back in play in less than half the time of those treated with placebos. Lastly, if you've ever had digestion problems or food sensitivities, enzymes may be the secret to getting past those roadblocks. It stands to reason that if you have trouble with digestion, you're probably not utilizing all the nutrients you're taking either, whether in high quality organic foods, or supplements. But — to make the point again — the enzymes you take for good digestion are different from the enzyme therapy for cancer, pain and other conditions. My Special Report The Missing Ingredient for Good Health goes into this in detail. Enzyme supplements are completely harmless and there's no known toxicity at any level. Some cancer therapists prescribe enormous amounts of enzyme supplements. The only side effects I've heard of are digestive upset, for some people, and perhaps a feeling of being "wired" or over-energized. Digestive upset is a commonly reported side effect for almost every pill on earth including placebos, so you'll have to make up your own mind on that one. The wired feeling may be bounceback in people who were desperately undernourished before they started enzymes. While no doctor says enzymes alone will cure cancer, those who've used them testify that enzymes are a powerful but largely forgotten weapon against cancer and other debilitating diseases. Those who are in the know say it's clear that enzymes should not be considered secondary supplements… they're just as important as vitamins, minerals, herbs, and antioxidants. Isn't it time to bump this simple, inexpensive, at-home preventive / treatment to the head of the supplement line to fight many battles for your good health? If you already use enzymes, and have seen a health spike from them, please go tohttp://www.facebook.com/pages/CancerDefeatedcom-Alternative-Cancer-Treatments-and-Natural-Medicine/189049627773377 and share your experiences with our alternative health community on Facebook. named to the second team. Jon Carlson pitched five no-hit innings in his first Big Train start. 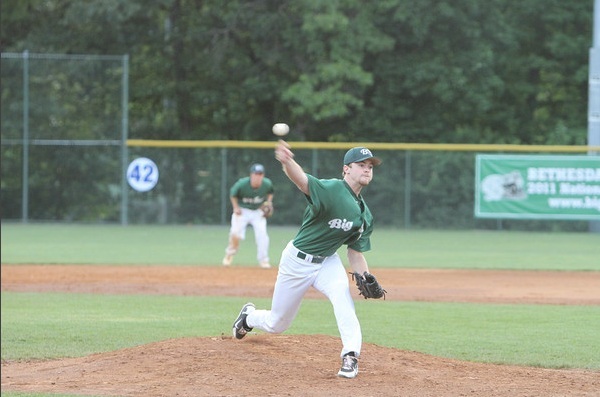 In a game that featured very few hits, the Big Train got one when it counted from Michael Bass (UNC-Wilmington) and beat the Alexandria Aces 4-3. All was quiet until Hunter Renfroe (Mississippi State) hit a ball straight towards the setting sun in the 4th inning. While no one seemed to be able to track the flight of the ball, it was ruled a home run after the third base umpire pointed to the fair side of the base line. In what would become a pattern, the Aces scored a run in the bottom of the 4th by scrapping together everything they could muster and bringing across a run while giving up an out. Though he did not give up a hit, five innings and 75 pitches was the limit for new Big Train starter Jon Carlson (High Point). Coming off an injury this season in college after a line drive broke his foot, Carlson pitched very well despite leaving the game with a no decision as the game was tied at one. After the Big Train fell behind 2-1 in the bottom of the 6th inning, the offense would work the bases loaded in the 7th. It was there thatMichael Bass picked up his first RBI of the night with a bases-loaded walk to tie the game at two. The Aces would strike again in the eighth on a sacrifice fly, giving them a 3-2 lead headed into the top of the final inning. After the first out,Cole Norton (St. Mary's (CA)) singled and Avondre Bollar (San Diego State) walked to give the Big Train two runners on and one out. A wild pitch made the situation even more tense as the runners advanced to scoring position. After getting ahead in the count, two pitches got byBass and the Big Train were down to the last strike of the game. ButBass took a pitch right back up the middle into center field to score both runners and put the Big Train in the lead for good. Hugh Adams (Florida Atlantic) would finish the game and earn the win for the Big Train, their fifth straight. The box score and play-by-play can be viewed here . The Big Train will travel to Towson to face the Baltimore Redbirds this Wednesday before returning home on Thursday night to kick off a three-game home stand. The Big Train will look to get back over .500 and move into favorable playoff position headed into the second half of the season. One of the biggest tragedies in the cancer epidemic is that science and technology gives a lot of people false hope. Especially women. Today's example: Too many women — and particularly those at high risk for breast cancer — don't realize that mammograms are hardly effective. Yes, they detect some tumors, but more than a third of breast cancers are missed in women with dense breasts. And more than 40% of women in the U.S. have dense breasts. A mammoth discovery is wiping out most breast tumors better than anything seen yet in modern medicine. It makes surgery, radiation and chemotherapy look like something from the Dark Ages. A Cornell-educated doctor followed more than 25 years of case studies and PROVED this treatment can cure breast cancer. With the discovery I'm going to tell you about, almost every woman makes it and without losing a breast to surgery or taking any toxic chemicals. Even those with late stage cancer! Several studies confirm that as tissue density increases, a mammogram's ability to detect lesions plummets. A mammogram done on a woman with dense breast tissues will show white areas where dense tissue is found. But the problem is, cancers also show up as white areas. Worse still, women with dense breast tissue are four to six times more likely to develop breast cancer. So you've got a huge group of women with the highest risk possible for this awful disease, who don't know they're at an elevated risk and have no way to reliably detect tumors. But there may be a solution on the horizon, at least in terms of early detection. It's called the Automated Breast Ultrasound (ABUS), and it appears to detect 30% more cancers in women with dense breasts who have normal mammograms. Better yet, it's in the process of becoming a required part of the screening process. A study in the September 2009 issue of European Radiology showed that automated, whole-breast ultrasound doubles the rate of cancer detection in women with high breast cancer risk and dense breasts. Even more incredible, it tripled the detection rate for cancers smaller than 10 mm. These findings provide plenty of justification for adding it to a widespread screening routine. This is important, because early detection is still one of the best ways to beat existing cancer. In fact, according to the American Cancer Society, early detection means a survival rate of 96%. How do you know if you have dense breasts? Breast density has nothing to do with the way a woman's breasts feel during an exam. It's got more to do with having more gland tissue (which makes and drains milk), along with supportive tissue (called stroma) that surrounds the gland. Dense breast tissue is hereditary, though it can affect women of all races. The simple answer to figuring out breast density is this: Take the volume of dense tissue in a woman and divide it by the volume of her breasts, then multiply by 100 for a percentage, and you have her tissue density. But what woman is able to figure out her own breast tissue volume? Instead, we rely on our medical system, and therein lies the problem. Currently, radiologists and physicians have access to tissue density information, but often withhold that precious information from patients. Just look at what's happening in California. There's a Senate Bill pending that would require mammogram providers to tell patients about their breast tissue density when their mammogram result letters are mailed out, since many doctors don't share this information. A similar bill was introduced last year and passed both the State Assembly and Senate, but was vetoed by Governor Jerry Brown, who echoed the concerns of the California Medical Association. They thought the required language — i.e., letting women know dense breast tissue puts them at higher risk and that they might benefit from additional screening — would cause women "unnecessary anxiety." Thank goodness at least for advocate and breast cancer survivor Amy Colton of California, who was diagnosed with advanced-stage breast cancer. She had three invasive tumors that her doctor said had probably been there for seven years. During those seven years she'd been getting "normal" mammogram results. Colton testified that both her physician and her radiologist knew she had dense breast tissue, but never told her that put her at higher risk, so she never knew to look into supplemental screening. Colton since has undergone sixteen rounds of chemotherapy, five surgeries, and six weeks of daily radiation, all because her regular mammograms gave her a treacherously false sense of security. That's one of the reasons automated breast ultrasound is so important. Not only is it better at detecting malignancies in dense breast tissue, it's also on the verge of being approved as a regular cancer screening tool. That way, women with dense breasts can be screened upfront instead of waiting to be informed they have dense tissue and then waiting for supplemental screenings. We've been waiting on this for a while. The technology for automated breast ultrasound was first cleared for diagnostic use in 2005. In October of 2008, the U.S. Food and Drug Administration approved its use to help diagnose women with abnormalities suspected to be breast cancer. But it still didn't become part of the routine screening process. According to the study in the September 2009 European Radiology mentioned earlier, whole-breast ultrasound (ABUS) found 32 out of 49 cancers in women with dense breasts, whereas mammography by itself found only 19 of the 49. Seems to me it's a woman's right to know whether she has dense tissue and needs additional screening. It doesn't make sense for doctors not to tell women about elevated risk. And if money is their big concern (isn't that always the case? ), they should consider that early detection and treatment saves tens of thousands of dollars over treating advanced-stage cancer — not to mention saving lives. So on one hand, it's great to know technology is advancing and improving. But fancy technology is pointless unless it gets integrated into routine diagnostic tests so real people can reap real advantages. In the meantime, any woman with dense breast tissue is advised to make sensible lifestyle choices to keep cancer risk at a minimum — like eating healthy food, limiting alcohol, staying at a healthy weight, exercising on a regular basis, and not smoking. And if you're a woman and don't know whether your tissue is dense, keep asking till you find someone willing to tell you the truth about your risk. Last month, the California bill passed unanimously in the Senate. Next step is the Assembly. And while California awaits the verdict, Texas and Virginia have also enacted breast density inform bills. Several other states are working on similar legislation, and Connecticut has already passed a law. And, in the fall of 2011 a federal bill was introduced that would require radiologists to inform mammogram recipients of dense tissue. I hate to say we'll have to wait and see, so if you're a woman, make sure you ask your doctor about your tissue density level. Unlike the Governor of California and his doctor friends, I don't think there's such a thing as "too much information" when it comes to your health. And if you've been told you have breast cancer, what then? Cancer Defeated publishes a guide on what to do called Breast Cancer Cover-Up. It reviews the best options for treatment, as we see them. The Special Report also covers thermography, a screening test for breast cancer that we think is far superior to mammography. (Mammography — in addition to being inaccurate — actually CAUSES cancer with its massive annual doses of radiation). Click here to learn more about this Special Report. And men have problems of their own when it comes to screening and early detection for cancer. It seems there's new evidence that the PSA test is nearly useless. If you missed this important news, please scroll down and read it now. After at least two decades of touting it as the gold standard for prostate screening, the medical establishment appears to be turning its back on the popular PSA test. In a May 2012 statement from the U.S. Preventive Services Task Force (USPSTF), co-chair Michael LeFevre, M.D., said that "men deserve to know what the science tells us about PSA screening: there is a very small potential benefit and significant potential harms." There's an amazing video that shows how a woman's cancer tumor was dissolved in 40 seconds! The orange-sized tumor disappeared in front of everyone's eyes withoutsurgery—and without anyone ever touching her body—while a video camera filmed the ultrasound screen showing the tumor dissolving in real-time. The video footage is incredible. Click here to watch the 5-minute video that will convince you that cancer is, indeed, curable. The touch-free healing practice that dissolved the tumor is just one of the top natural cancer cures that health practitioners have hailed as the "best of the best." In the video, you'll discover 5 equally powerful natural cancer cures that deliver stunning results. You're not likely to hear about these from your doctor. The government group is now saying that the 'cons' of having the test generally outweigh the 'pros' for most men under age 75. The 'cons' are nasty indeed: If this unreliable test indicates a man may have prostate cancer, the next step is a biopsy. This is a highly invasive test in which small samples of tissue are cut out of the organ to be examined for cancer cells. A biopsy can result in pain, fever, bleeding, infections and problems urinating. Worst of all, if cancer cells are actually present, it can spread them. After all this risk and discomfort, the biopsy will often show no cancer is present — because the PSA test that prompted the biopsy in the first place is so often wrong. And what if you DO have cancer? Let's suppose the biopsy does find cancer. What then? The most likely next steps are surgery or radiation. You might think, "Wonderful, the PSA test led to early detection and treatment!" Not so fast. Most prostate tumors are pretty harmless. Surgery and radiation are NOT needed. The best option is to do nothing. So, in reality, the PSA test has led to overtreatment. And the treatments can lead to lifelong incontinence or impotence, not to mention a lot of pain, expense, lost work days and who knows what else. Well, actually, we do know what else: the fear, stress and anxiety of worrying about a cancer that didn't pose a threat. Each year about 1,000 to 1,300 men die from complications connected to treatments that took place because the victims had a high PSA score. As I've written in this space before, only about one prostate cancer out of ten is aggressive and therefore life-threatening. In a large study called the Prostate Cancer Prevention Trial, only 28% of men in their 60s who had a high PSA score turned out to have cancer as shown by a biopsy — slightly more than one man out of four. The rest — 72 out of a hundred -- had a high PSA score, but NO CANCER. And of those who had cancer, only about one out of ten died of it. To be exact, 3 died out of every 28 men whose biopsies showed cancer. And don't forget, that's 3 out of the 100 who had a high PSA score at the beginning of this whole mess. I want to underscore this: Out of a hundred men with a high PSA score only 28 had cancer and only three died of it. This test is all but worthless, and that's what the U.S. Preventive Services Task Force now confirms. The USPSTF reviewed previous research on this subject, including two large studies in the U.S. and Europe. When they compared men who were routinely screened with the PSA test and those who were not, there was no difference in death rates over a ten-year follow-up. Again, I want to underscore this: Men who were tested like the dickens for prostate cancer were just as likely to be six feet under a decade later as those who weren't tested at all. Now, there's a curious twist to this story. Most studies have focused on five-year survival rates, and found that PSA-screened men ARE more likely to survive more than five years. Why doesn't that hold up when you look at a ten-year time frame? It's actually simple, when you think about: Finding cancer earlier means you live longer knowing you have it. Consider an example: If John Smith died of cancer in 2010 and it was first diagnosed in 2006, he's not a five-year survivor. But say he had a PSA test in 2003 and a biopsy then detected cancer. He still dies in 2010 — but, bingo! Now he's a seven-year survivor! And that's exactly why the PSA test, biopsies and aggressive treatment are trumpeted as increasing five-year survival rates. The men do NOT live longer. They die at the same time they would have anyway. But the cancer is detected earlier and in the official records those men beat the five-year mark. When the USPFTF focused on ten-year survival rates, they exposed this bogus claim of success, and the PSA test was revealed to be almost worthless. The group advocates putting a halt to PSA screening tests unless a person "makes the personal decision that even a small possibility of benefit outweighs the known risk of harms." The panel said the best option would be to pursue better testing and treatment options. Clearly, what's needed most is a test to identify aggressive cancers and distinguish them from slow-growing cancers that — in men over 60 — could be left untreated. There's some action on this front, but no reliable test yet, as far as I know. Supposedly there IS a way to get some good out of the PSA test — observe the trend over a series of tests. If you're tested every six months and the PSA score is trending up, some doctors say it indicates an aggressive cancer may be present. Biopsies and more aggressive treatment may be warranted. Quite a few urologists and oncologists are now working on this assumption, but I don't know how much evidence there is to support it. For what it's worth, I have a dog in this fight. My PSA number is slightly elevated and increased very slightly over the past year. I'm not alarmed, but I'll get tested again in six months and see if there's an uptrend. It's called "watchful waiting" — and it's by far the most sensible strategy for most men who have a high PSA score and even for those who are told they have a tumor. Urologists and even general practitioners are reluctant to give up on the PSA test. They continue to use as if it means something. My guess is that most men middle-aged and up are still being regularly tested. "Do nothing" is not an appealing strategy to most people — and that includes patients, who are easily panicked into biopsies, and then into radiation or surgery, when a doctor starts throwing around the "C" word. Cal Visits Povich Field! Big Train beat Orioles 12-1! Saturday's game against the Youse's Orioles came with a special treat for Povich Field attendees. 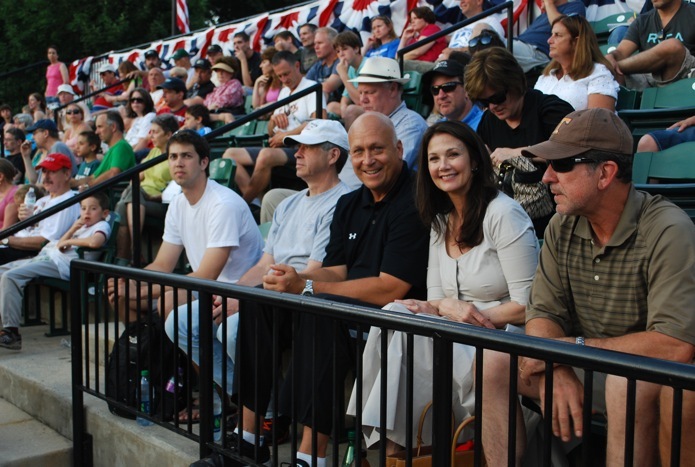 Oriole Hall-of-Famer Cal Ripken Jr. was in attendance to watch his son, Ryan, play against the Big Train. Cal also brought Lynda Carter and her husband, Robert Altman, to the game with him. Carter is best known for her portrayal as the DC Comics superhero Wonder Woman on television throughout the 1970's. Her husband, Robert Altman, is the current chairman and CEO of ZeniMax Media, the parent company of Bethesda Softworks LLC, a nationally renowned video game company. 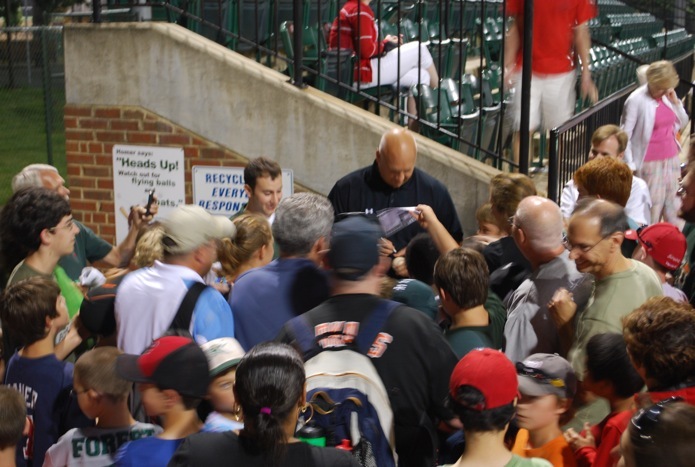 After the game, hundreds of fans stayed at Povich for their chance to meet Cal. He was happy to oblige, but not before meeting with the Big Train's star player and center fielder Hunter Renfroe (Mississippi State). Cal with Zach Randolph (left) and Hunter Renfroe (right). The ball leaving Renfroe's bat (and Povich Field) on his first inning grand slam. Though the Big Train were not technically the home team on Saturday night, you would have had a lot of trouble figuring that out. The game was played at Povich Field and the Big Train played as if they were at home sweet home and demolished the Orioles by a score of 12-1.The Big Train got on the board early as Michael Bass (UNC-Wilmington) walked, Brendan Hendriks (San Francisco) reached on an error, andAdam Barry (Cal State Northridge) was hit by a pitch. That broughtHunter Renfroe (Mississippi State) to the plate to hit the Big Train's first grand slam of the season. The Orioles had it just as bad in the second inning. After Brennan Middleton (Tulane) was hit by a pitch and Bass walked again, Hendrikssingled to bring in a run. Then Barry singled and Renfroe walked leading to a bases-loaded single from Tucker Tobin (George Mason) to score another run. After an error by the right fielder brought home two more, the score stood at 8-0 after just two innings. While the big innings were over, the Big Train were not done scoring. Four more runs would go up on the board before the end of the game compared to just one from the Orioles. The biggest of those runs wasRenfore's second home run of the night. Ryan Doran (San Diego State) starred on the mound for the Big Train as he had a no-hitter through 4.1 innings with the score 11-0. He ended up getting the win after pitching five innings on just one hit and no walks while striking out five. Stuff yourself with this fat and get healthy! Do bees have the answer to cancer?